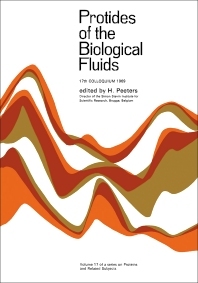 Protides of the Biological Fluids documents the proceedings of the XVIITH Colloquium held in Bruges in 1969. This book is divided into three sections. Section A discusses the genetics of the antibody response, focusing on the evolutionary aspects and genetics of differentiation centered on the problems of immunoglobulin structure and deficiencies. The molecular variation occurring in the amino acid sequence of various proteins, its ways of detection and its physiological significance, is presented in Section B. Some of the proteins considered include hemoglobin, fibrinogen, complement, and lipoproteins. Section C is devoted to the developments in theoretical and instrumental aspects of electrofocusing, considering the ampholyte structure and function and techniques, such as gel electrofocusing and preparative column electrofocusing. This compilation is beneficial to researchers and specialists concerned with protides of the biological fluids. The Genes of the Gm System, Are they Structural Genes?